Serious food from a serious chef---plus service that puts you at ease to enjoy it. 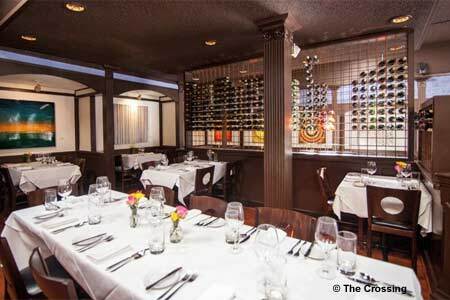 : French and Italian influences are trending upward, and The Crossing is poised to capitalize --- just as it was back in 1998 when owner Jim Fiala opened this mainstay of the Clayton dining scene. You may well see limos parked out front and the city's movers and shakers tucked into the creamy dining room. Despite that, service is unpretentious and friendly. Beware the blue cheese soufflé placed on your table shortly after arrival; it's addictive and filling. Start with amberjack crudo with caviar, pan-seared foie gras with greens and berries, or lamb sweetbreads. Then discover egg raviolo, a farm-fresh egg inside a ricotta ravioli. Beef tenderloin and bison loin are both local and grass-fed. All three tasting menus are a steal, and happily they all include the signature warm chocolate torte. An expansive, European-leaning wine list offers a good number of quartinos, perfect for discovering new styles and regions.